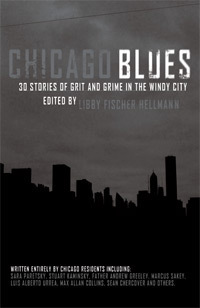 Editor Libby Fischer Hellman put together a worthwhile collection of Chicago mystery/crime stories in Chicago Blues, published in 2007. I can’t believe it took me until 2010 to buy and read the book! As she wrote, “Some of the twenty-one dark, edgy stories in Chicago Blues are about people who sing the Blues, and some are about people who wear the Blues.” I meant to do a wrap-up of the stories, as each one seemed even better than the last, but neglected to do so until Jenny reminded me. Although all 21 of the stories are well-chosen, well-written, and fun to read, the ones that featured music had an edge for me. I set out to rate the stories, but found that they were so consistently top-notch that my ratings were a series of very fine gradations. And who’s to say that my four-star stories wouldn’t be five-star in your estimation, and vice-versa? So, instead, here’s a listing of the short stories and a short comment from me. My top five stories – the ones that made me say “Wow” – are in bold. Blue Note – Stuart M. Kaminsky Great story with a change-up ending about the nature of love and of singing the blues. O Death Where is Thy Sting – Kevin Guilfoile Fun for its focus on obsession and twisty ending. Your Sweet Man – Libby Fischer Hellman O’Henry-esque. Good Evenin’, Blues – Jack Fredrickson In the shadow of the el, a bar owner struggles to make sense of it all. Guarding Lacey – Kris Nelscott A Smokey Dalton story told from a kid’s POV. Overproof – JA Konrath A Lt. Jack Daniels story about suicide by cop. The Non Compos Mentis Blues – Sean Chercover Ray Dudgeon noir. Chasing the Blues – Michael A. Black Vice cop secrets. Blind Man Blues – Steven B. Mandel Cop Billy Call carries a torch for his long-missing former flame. Or is she? A Weekend in the Country – David A. Walker The blue brotherhood and father-and-son relationships with a bitter edge. A Shade of Blue – Michael Allen Dymmoch John Thinnes and the return of repressed memories. The Test – Sam Reaves The nature of friendship in the Outfit. True blue, but still a downer. My Heroes Have Always Been Short Stops – D.C. Brod True blue Cubs fan and murder. Code Blue – Mary V. Welk Vigilante nurse. A little over the top. The Sin-Eater – Sam Hill Powerful short story about family redemption. No One – Marcus Sakey Mr. Ordinary fights his hair-trigger temper, and loses. The Lower Wacker Hilton – Barbara D’Amato Suze Figueroa and Norm Bennis find out that the lowest of the low still own things worth killing for. If you’ve read the book, take a minute and let me know what stories were your favorites! This entry was posted in Commentary, Review and tagged Chicago Blues, Libby Fischer Hellmann, Review, Short Stories. Bookmark the permalink. I like your quick, sentence explanations because they leave me wanting to read it more than a longer review that might be enough to satisfy my curiosity. I like the Chicago theme running through (as you would expect by the title). I agree–this is a great collection of short stories and it pointed me to a few authors whose work I hadn’t read before it came out in 2007, but have since been exploring since (such as Marcus Sakey and Sean Chercover).